The IBEW Local Union 6 has a proud history of making a difference in its community. Local 6 touches the lives of people through various kinds of community service, recognizing that it has a particular responsibility to be a good corporate citizen. The IBEW Local 6 has made it an integral part of its mission to invest in the future of the community, and to give back to society. Volunteers are always needed to participate in these activities. 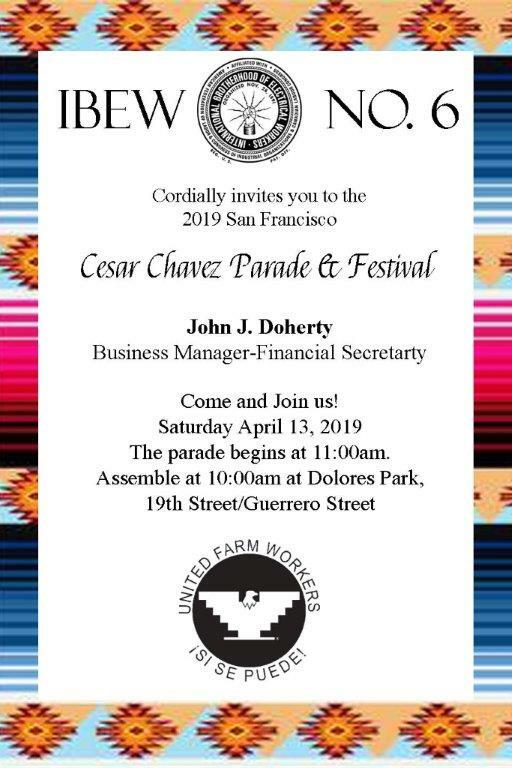 Contact the Union Hall 415-861-5752 for further information to volunteer or participate. Look for detailed information regarding these events on the website calendar, at Union Meetings and through mailers. A new 14 story Mixed Use Residential Development, by Oryx Partners, is set to take place of the old KRON4 building. With the lease for the SoMa McDonald’s at Third and Townsend expiring in January 2017, San Francisco’s Planning Commission is now slated to approve the plans for an eleven-story hotel to rise on the 701 3rd Street site early next month. As proposed by Stonebridge Companies, a Colorado-based hotel development and management company, and designed by Stanton Architecture, the 105-foot-tall building would yield 230 hotel rooms and 2,000 square feet of retail space on the corner, with an underground garage for 14 cars. The Oceanwide towers at First and Mission Streets, designed in collaboration with London-based Foster + Partners, will dramatically change San Francisco’s skyline in the fast-rising Transbay District. The project will be comprised of two towers, 910 feet and 605 feet tall, respectively. When complete, the 910-foot-tall tower will be the second-tallest in the city. The project takes advantage of the transit-oriented location by incorporating commercial, residential and hotel into the mixed-use design, and will total 2 million square feet. Incorporated into the design is a half-acre of public space that will sit beneath the tallest tower, and will act as an urban living room. While facing an appeal related to its expected environmental impact, Shorenstein’s proposed plans for a 304-unit apartment building to rise up to 12-stories at Jones and Golden Gate Avenue, with a skinny namesake spur at 1066 Market Street, were approved by San Francisco’s Planning Commission. In addition to the 304 apartments, 36 of which are currently expected/required to be rented at below-market-rates, the Mid-Market development includes a subterranean garage for 102 cars and 304 bikes, and 4,500 square feet of retail space on the ground floor of the building. 63-Unit Mixed Use Project Approved at California and Polk St. The Polk Street Boxing Gym has been shuttered. The Out of The Closet Thrift Store and adjacent Fashion Exchange should soon follow suit. after an approval at SF's Planning Commission, a seven-story building with 63 condos over 8,000 square feet of new retail space and an underground garage for 41 cars will rise up to 80-feet in height on the southeast corner of Polk and California. Once you have registered and been accepted you will be able to view the calls taken and the open calls. Out or Work list is posted under Member Sign-In in the Member Resources drop down menu.